Dragon*Con isn't only popular with fans of sci-fi and fantasy. Many celebrities make sure to put the Atlanta, Georgia fan convention on their calendar year after year. We asked a few veterans of the annual mega-geek-fest – taking place over this holiday weekend – what makes this particular convention so unique. Pierre Bernard, graphic artist for "Conan," said he likes the intimacy of the Con: "What blew my mind is that the convention takes place literally at the hotels where everyone is staying. At the hotel, everyone is mingling and hanging out. It's like a dorm party at a university. If you like meeting new people, you're guaranteed to make new friends at this convention. I feel like I'm going to an extended family reunion every year." Felicia Day, star of "The Guild," "Dr. Horrible's Sing-Along Blog" and the upcoming "Dragon Age" web series, had this to say: "Dragon*Con is really unique in that it's run by fans, and has less of a corporate air to it than the average convention. And because it's run by fans, it tends to cater to even more niche interests, which I feel is kind of awesome. It definitely aims to appeal to every specific geek out there. It also has bar-none the best costumes I've ever seen, even above Comic-Con, so I always go just to take pictures of people." Doug Jones, best known for playing bizarre creatures in "Pan's Labyrinth" and "Hellboy" (and currently appearing on "The Guild"), said, "Dragon*Con, next to San Diego [Comic-Con], is my absolute favorite. Love the costumes. I also love the layout of it, all the hotels strung together, so it's like a 24 hour party. It never stops." 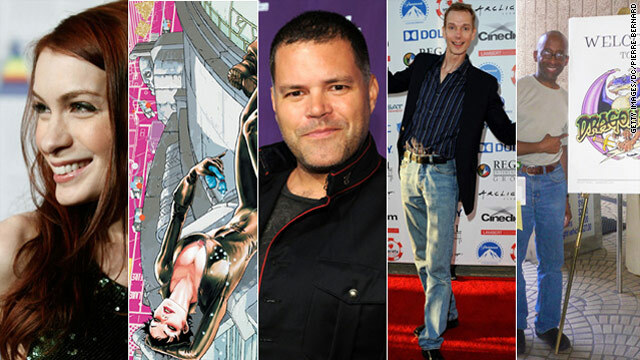 Judd Winick, writer of the new "Catwoman" and "Batwing" series for DC comics, said: "Dragon*Con's fun, Dragon*Con's wild. You've never seen a better display of people in costume in one's life. A bunch of us were out there one night - Geoff Johns and Greg Rucka - and we saw people just hanging out in costume. They were some of the most amazing costumes we've ever seen, just from regular folks. It was terrific." "Battlestar: Galactica" fan favorite Aaron Douglas is a regular at the convention: "Dragon*Con is one of the last sci-fi/comic book conventions still run by fans, for fans. It is a wonderful expression of all things geek. It occupies the last weekend of the summer, one last chance to blow out your geek before those costumes are simply not enough for the fall and winter. I come back to Dragon*Con every year for the fans, my friends and for a chance to partake in the biggest party outside of Las Vegas. Geek is chic and Dragon*Con is the mother of all things geek." First time attendee disappointed that it took 2.5 hours to get a badge! DC only had TWO people taking credit/debit card payments! If you go, take CASH as that gets you through faster! Too bad they dont tell you that! DragonCon doesnt tell you alot of stuff! This year was my first year too and it was insane! I didnt get to do half of the stuff I wanted to do because I had to wait around for 2 hours for each panel just to make sure I was there in time to get in line to wait for another hour! The one thing I didnt mind is getting my badge, I was actually in and out in 10 minutes. It really just depends on what time you go to get it. I will be going back though... lets hope I have better luck with my photo ops next time. Yeah, yeah...Aaron Douglas meant run by fans but still fun and interesting. He doesn't care about your geekfest at the local mall. I live up in Washington state, to years ago I attended ECCC (Emerald City Comic-Con). Definitely one of the best events I have ever attended. While there I had my picture taken with Aaron Douglas and saw Felicia Day. Geek culture is alive and thriving today. Let there be more fan driven conventions. I'm stunned by the shameless ignorance of the Hollywood people who don't know that there are over a hundred fan-run not-for-profit SF conventions every year in North America alone; and even more by the fact that they don't know that (unlike fan conventions) Dragon*Con is a for-profit corporation (one which has, by the way, sucked the life out of every actual non-profit convention any closer to Atlanta than Chattanooga). Ms. Day, I might like Dragoncon, too, if my VIP status meant I got escorted through crowds, and was able to get on the elevator ahead of people who had been waiting for 45 minutes. Since I'm not a VIP, I'll still to the ones run by my friends, which only give VIP status to the Guests of Honor. If you ever come to Balticon or Capclave (in Baltimore and DC), you'll know what fun is! One of the last conventions run by fans? There are easily a dozen practically every weekend! For instance, this weekend, even up against Dragon*Con, there's the 31st edition of CopperCon in Mesa, AZ; two furry conventions; four gaming conventions; three anime conventions; and a Transformers convention– and that's just looking in the US and Canada. Ms Day, come to any one of many fan run conventions, both large (Like the annual World SF Convention) and small, which can be found in almost any city across North America. We're fans, and we run many great non corporate cons, which are fun. In northeast Ohio in the Cleveland area, we're starting a small geek convention as well, called N.E. Geek Expo. I really appreciate you guys doing so much coverage of Dragon*Con, because we're starting out exactly the same way they did– a group of fans who wanted to bring a local con to their area. As a thank you to folks taking a chance on us in the beginning, we're giving free booth space to vendors and free admission to attendees. You can check us out on Facebook at http://www.facebook.com/NEGEEKEXPO , or follow us on Twitter @NEGeekExpo_Ohio.